Rise of the Kiwi Cirie? This episode's big move from Lisa—taking out her idol-"sharing" ally, and gently, subtly using her persuasive skills to convince his own (still secret!) close friend to join her in doing it—that's the stuff of which Survivor legends are made. That it also ended up a 3-2-1 vote, just as Cirie's big power play in Panama did? That's just icing on the cake. Brava. The parallels extend a bit further. Lisa, like Cirie 1.0, came into the game presenting a fish-out-of-water persona, reducing people's perception that she might be a threat. Cirie was afraid of leaves. Lisa was just your average superfan, ticking off items on her Survivor bucket list. No worries, people! Move along! Continuing the camouflage in the post-merge, neither Lisa nor Cirie is much of a challenge threat. Lisa now sits at a 31.5% Mean % finish in individual challenges, which is similar to Cirie's 36.7% in Panama. Because of this, neither of them leap immediately to the head of anyone's target list. At least, not in the way that, say, a Matt Hancock should, just as a random example. But that's all secondary to the degree of difficulty in the move Lisa just pulled off. Matt was trusted and well-liked, at least by the people still in the game. He was tight with Adam. He was obviously very close to Dave. He was probably even Lisa's closest ally. Oh, and did we mention: Matt had an idol, and Lisa knew about it. And the one key vote that she convinced to swing and vote Matt out? Matt's high school friend, Dave. Wow. As several people have pointed out (such as Shannon Gaitz and Des Quilty on RHAP), there are additional positive effects to the way the vote played out. By selecting Tess as the decoy vote, Lisa convinced (a heartbroken) Adam to vote against his one true ally. As the preview shows, that perceived betrayal gets aired out back at camp next episode. Tess also cast the first vote anyone has made against Tara. These stray votes make it unlikely that an Adam/Tess/Tara trio will unite at the next vote to take out one of the two now-leading winner candidates, Lisa or Dave. Adam's disdain for both Dave and Tara also limits that option. All very well executed. In an American season, this move would probably be enough to win Lisa the game, assuming she reaches the finals. It remains to be seen if the same is true with this NZ jury, who mostly seemed surprised to hear Matt touting Lisa's accomplishment. To be fair, we haven't really been shown much of the other players talking about Lisa, which is worrisome. Last season in Nicaragua, Barb seemed to have amassed a significant amount of winner equity shortly after the merge, only for the show to reveal a couple of episodes later that the jury and many of the remaining players had a sneering disdain for Barb, and that Barb was well aware of it (even though the show hadn't let on until then). Let's hope that's not the case here. Lisa's well-planned and well-executed gameplay here ought to be equally well-respected by the jury. She's earned a rightful spot in the pantheon of great Survivor strategists. Jeff Probst may be wrong, you may not have to make big moves to win. But that doesn't make pulling off a move as big as this any less impressive. Not only was the gameplay in this episode top-notch, it also had an extra layer of significance due to its collision with the season-long Dave-and-Matt-are-secretly-friends storyline. Voting out his friend was not a move that Dave made lightly. Dave's agonized back-and-forth thought process as he debated with himself, mid-confessional, about turning on Matt was a powerful reminder that even though this is a game show, voting against people you're living with can be fraught with emotional turmoil. It's easy to say "it's just a game" when you're thinking of turning on some person who was a complete stranger to you a month ago, or someone who's irritated you since that first meeting. That decision becomes much more difficult when the potential backstab-ee also happens to be a close friend, even more so when they're also a real-world friend. That's the payoff that US Survivor was hoping for (but mostly failed to deliver) with the Blood vs. Water format. For the American version, the alleged emotional pinnacle was when a mom (Laura Morett) teared up talking about how her daughter (Ciera Eastin, a fully grown adult with children of her own) was symbolically growing up. Now sure, children growing up always induces parental tears, understandably, but this sequence was all a build-up to what was essentially a non-move: Ciera, powerless to change the vote's outcome, decided to tell her mom she would be casting a throwaway vote against her. That was it. CBS trumpeted this moment as an iconic TV event in real time, then harkened back to it all through the run-ups to BvsW's sequel season, San Juan del Sur, and during the pre-season for Ciera's third appearance on Game Changers. It had nothing on this. In agreeing to this move, Dave took Matt from a position of absolute power, and shoved him out the door, on to the jury bench. All while Matt had an idol in his pocket! Dave and Lisa now stand to gain an immense amount of power from this, as long as their alliance with Tara holds. But it was still an incredibly difficult move for Dave to make. This was his high school friend he was betraying! This is all such a gray area in the ethics of Survivor. Matt really had talked about wanting to win, and how he's not playing the game just so that Dave can take home the quarter-million-dollar prize. At various times this season, both Dave and Matt have seemed a little out of sorts about having had to protect their old mate from the vote. They're friends, but they're also competitors. But as we can see in his confessionals, Dave is legitimately emotionally hurt that Matt, his longtime friend, has seemingly betrayed him, by sharing info (his idol) with Lisa, but not with Dave. Or at least that Matt thought about doing so. And yes, Lisa was 100% taking strategic advantage of Dave's paranoia by pointing out the betrayal inherent in Matt not telling Dave about his idol. But to be fair, she also had no idea that there's an extra layer to this, and that this is potentially taking a dagger to a real-world relationship, and not just dividing two people playing the same game as her, two people who first met each other 20 days ago at the tribe swap. Just last week, we were sure Matt was the prohibitive front-runner to win the entire season. This week, he's a juror. Shows what we know! Matt took his exit gracefully, and he can take some comfort in the fact that his stats rank him as one of the best Survivor NZ players ever (yes, a small pool so far). Not only that, but he would also rank as elite among the 36 seasons'-worth of US Survivor players. Matt was, of course, a bona fide physical player. Matt ended his Thailand run with a 79.2% Mean % finish in challenges, which would put him in the Top 20 all-time for a single season in U.S. Survivor. His mark is also well ahead of last season's challenge beast, Tom Paterson (71.3%). Matt was also instrumental in his multiple wins for his pre-merge tribes, ranging from the first episode's immunity challenge, to the Ep3 IC where he and Josh tag-teamed the diving portion, collecting Khang Khaw's nine discs in the time it took Chani to collect just two. These are all accomplishments that had little to nothing to do with Dave's presence in the game. In addition to Matt's physical accomplishments, he was also clearly involved in, if not running, much of the post-merge strategy. He was solid at Tribal Council, voting six people out in eight tries, and receiving only four votes against him. (Two marks that would be much better if he'd just played his idol this episode.) Here, his secret connection to Dave certainly helped a bit, as Dave deflected a post-swap vote away from Matt, but as we argued two weeks ago, Matt and Dave's friendship has also presented unique difficulties that they've found difficult to navigate. Matt and Dave only ended up voting together four times, two of which were unanimous votes (the Dylan and Eve boots). 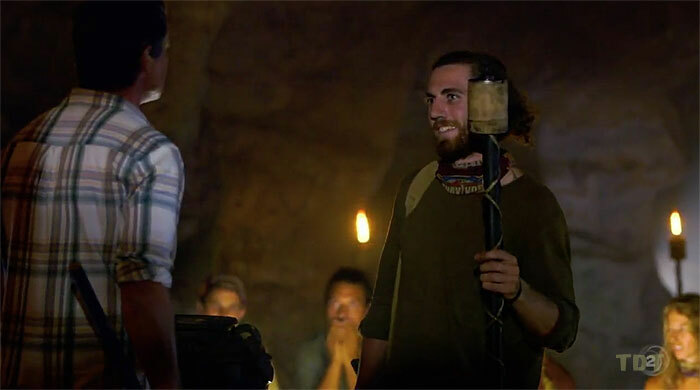 Also, in the end, according to Matt's exit interviews at least, Dave told Matt not to play his idol at this episode's Tribal. That extracurricular trust Matt had with Dave ended up working against him. Friends on Survivor: Both a blessing and a curse. Simply put, Matt was a really good all-around Survivor player. Which is why it made perfect sense for Lisa and Dave to want to vote him out. Had Matt made the finals, he probably would have won. Even more impressive than his in-game achievements was Matt's immediate post-boot praise for Lisa's game, as seen when he talks to the other jurors in his Jury Villa video. It's wonderful to see Matt's ability to separate real life from the game, then to process everything in the moment and heap praise on the main person who tricked him, resulting in his boot. Great all-around player, great-seeming all-around guy. - Larry the lizard king: He's no Mark the Chicken, but Tess's abandonment of the game to spend time with her reptilian friend was a fun moment. Not only was this sequence entertaining on its own, but it also set up the neat contrast between Tess's resigned retreat into non-play and Lisa's hard-fought splitting of the Matt/Dave duo. A strong echo of their divergent edits in the very first episode. - Cold idol hands: There have now been four idols in the game for Survivor NZ: Thailand. Three have now left the game, and together, those three have canceled out a grand total of zero votes. Hooray? To be fair, the potential of Matt playing his idol did ratchet up the tension this episode, and for that alone, the idol experiment has been a success. Still, not a roaring one, shall we say? - Adam's alphabetical enemies: First it was Dylan. Then it was Dave. What does Adam have against people whose names start with D? Good thing Dee from the first season didn't end up here. Luke Harries at The Spinoff: "Week 12: One checkout, one blindside"
Kemper Boyd at PurpleRockPodcast.com: "Episode 12 recap"
Evan Francis at InsideSurvivor.com: "A Monday well-spent"
Jack Van Beynen at Stuff.co.nz (7/9/18): "Matt Hancock is 'proud' of Lisa for betraying him"
Kyle & Bryan at 2 Boys Talk Survivor (7/9/18): "2BTS NZ Thailand E12 Exit Interview"
Ryan Brink at Brink of Reality (7/9/18): "5th Juror Survivor New Zealand: Thailand Exit Interview | Episode 12"
Shannon Gaitz at RHAP: "Thailand Episode 12 RHAPup | Des Quilty"
Estelle Clifford & Matt Chisholm at TheHits.co.nz: "Survivor Radio - Episode 12"